The No. 13 seed pulled off two upsets in last year’s March Madness action and this year #13 seeds Saint Louis, Vermont, UC Irvine, and Northeastern are trying to replicate last year’s upset magic. The 13 vs. 4 seed is not as common as the popular 12 vs. 5 upset, however, it’s happening more often in recent years. Overall #13 seeds are 28-108 all time. That’s barely a 20 percent winning rate. Some of the teams that pulled off an upset from the “unlucky 13” seed include Navy, Richmond, Manhattan, Princeton, Valparaiso, Kent State, UNC Wilmington, Vermont, Cleveland State, Murray State, Morehead State, LaSalle, and Hawaii. Over the last three years, the #13 seed is 3-9 with a pair of upsets last year. In 2018, #13 Buffalo picked off #4 Arizona and #13 Marshall upended #5 Wichita State. The Saint Louis Billikens (23-12) finished in sixth place in the Atlantic 10, but they ran the table to win the A10 tournament. The Billikens won four games in four days and beat St. Bonaventure in the A10 finals by two points. Senior guard Javon Bess leads the Billikens in scoring with 15.3 points per game. They are one of the better defensive teams in the country allowing only 64.1 points per game. This is a matchup between two strong defensive teams. Virginia Tech allows on 62.1 points per game, which is #11 in the nation. This is up against high-scoring teams in the ACC like Duke and North Carolina. VaTech (24-8) held their own in the ACC with a 12-6 record. Nickeil Alexander-Walker, 6-foot-5 sophomore guard from Canada, leads the Hokies in scoring with 16.6 points per game. Virginia Tech opened as a 10-point favorite. According to Ken Pomeroy’s ratings, Virginia Tech is a highly-respectable #11, while St. Louis is #104. VaTech picked up big wins against Duke, Syracuse, and NC State. The Hokies had some bad losses against their rival Virginia (twice), Louisville, UNC, and FSU. The three Duncan brothers from Vermont got their wish to play in a March Madness game together. Vermont locked up another America East conference tournament title by picking off last year’s Cinderella UMBC after losing to them twice this season. Vermont (27-6) won 12 out of their last 13 games and the Catamounts are riding a six-game winning streak. Despite their lack of size, Vermont plays tough man-to-man defense. They allowed only 62.6 points per game this season, which is 16th best on the country. FSU (27-7) is one of the hottest teams in the country right now. They won 14 out of their last 16 games. The Seminoles rocketed into the Top 10 this week in the latest poll. They nearly ran the table in the ACC tournament, but got stopped cold by Zion Williamson and Duke. Mfiondu Kabengele, 6-foot-10 sophomore forward, leads FSU in scoring with 12.9 points per game. Terance Man, senior guard, is the crafty veteran on the team averaging 11.2 points and 6.4 rebounds. He hit a huge shot in overtime to beat Virginia Tech in the ACC quarterfinals. FSU opened as an 11-point favorite over Vermont. According to Ken Pomeroy’s ratings, FSU is #14, while Vermont is ranked #80. FSU beat Virginia Tech twice, Virginia, Louisville, Purdue, and LSU. South: #13 UC Irvine vs. #4 Kansas St.
Big 12 versus Big West action. Not too many teams in the tournament won 30 games this season, but UC Irvine is one of them. 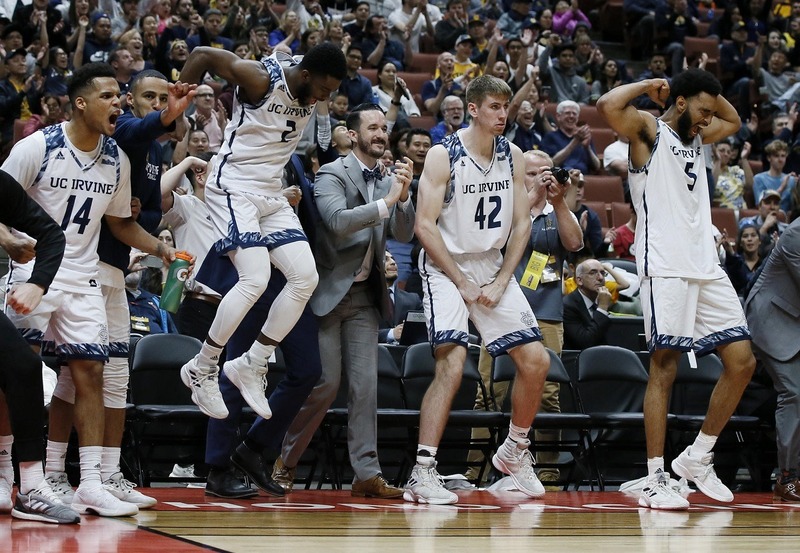 The UC Irvine Anteaters (30-5) went 15-1 in the Big West regular season and then won the conference tournament to lock up a March Madness berth. They only went once before in 2015 and have yet to pick up an upset win. Head coach Russell Turner won 21-plus games in six out of the last seven seasons in Irvine. He’s a former Golden State Warriors assistant who got his first head coaching job with UC Irvine in 2010. The Anteaters make you work hard for your points. They allow only 63.3 points per game in the run-and-gun Big West. Max Hazzard, a 5-foot-10 junior guard, was told he was too short to play in the Pac-12. Instead, he’s been ripping up the Big West. Hazzard leads the team in scoring with 12.5 points per game. He dropped 23 on Cal State Fullerton in the Big West title game. Kansas State Wildcats (25-8) titled with Texas Tech for the Big 12 regular season title. They are the third-best defensive team in the country allowing only 59.2 points per game. Kansas State doesn’t score a lot of points, so they play a lot of close games. Barry Brown, 6-foot-3 senior guard, leads the Wildcats with 14.9 points per game. Kansas State is only a 4-point favorite against the Anteaters. According to Ken Pomeroy’s ratings, Kansas State is #23, while the UC Irvine Anteaters are ranked #75. Kansas State has notable victories over Kansas and Iowa State. They also posted losses against Kansas, Texas Tech, Marquette, and Iowa State (twice). Not to be confused with the Big Ten’s Northwestern, the Northeastern Huskies (23-10) are located in Boston. Northeastern won the Colonial tournament to earn their automatic bid over Hofstra. Northeastern started the season 2-4 and since corrected the ship. The Huskies are rocking a seven-game winning streak. They also won 12 out of their last 13 games. Vasa Pusica, a 6-foot-5 senior guard from Serbia, leads Northeastern with 17.8 points and 4.2 assists per game. Kansas (25-9) came into this season as the team to beat. The Jayhawks kicked off the year with a big win over Michigan State. They started the season 9-0. They went 12-6 in the Big 12 this year with big wins over Texas Tech, Oklahoma, TCU, Iowa State, and Kansas State. Dedric Lawson, a junior forward, leads the Jayhawks with 19.1 points per game and 10.3 rebounds per game. Udoka Azubuike, 7-foot-1 junior center from Nigeria, averages 13.4 points per game and he hits 70 percent of his shots. Kansas opened a 7-point favorite over Northeastern. According to Ken Pomeroy’s ratings, Kansas is #20, while Northeastern is #79. Kansas lost to Kentucky, Arizona State, Villanova, Kansas State, and Texas Tech. Northeastern lost to notable teams such as Virginia Tech, Syracuse, and Vermont.